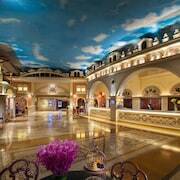 The Marco Polo is a good choice for a stay in Shenzhen. I spent a week in Shenzhen on business and found the Hotel Staff to be very helpful and courteous. No matter you come to Shenzhen by air or by train, you can easily reach this place and enjoy the convenience of being right in the centre of downtown Shenzhen. We got upgraded to executive floor , very nice! Nearby to MTR station, just 5 mins walk, Nice! The only point was bad is the washroom got bad smell when checking in. Where to find Shenzhen hotels near an airport? 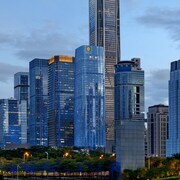 How can I find hotels in different Shenzhen neighborhoods? Where can I find hotels in Shenzhen that are near tourist attractions? From the budget level to the more luxurious, Shenzhen offers loads of comfortable hotel and apartment options. Expedia offers 239 short- and long-stay options within 0.1 kilometres (0.06 miles) of Shenzhen's heart. 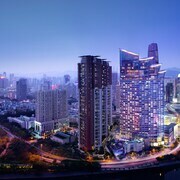 Securing accommodation close to the inner-city sights and action of Shenzhen couldn't be easier. Expedia's database lists the Grand Hyatt Shenzhen and Shangri-la Hotel, Shenzhen, which you'll find within a 1-kilometre (0.6-mile) radius of Shenzhen's center. 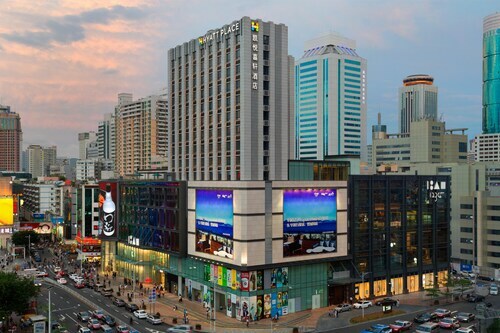 Luohu, a popular Shenzhen hotel area with 127 Expedia-listed lodging options, is 2 kilometres (1 mile) from downtown. 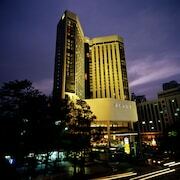 Some accommodation options in Luohu include the Six Star Motel and The St. Regis Shenzhen. An alternative is Yantian. 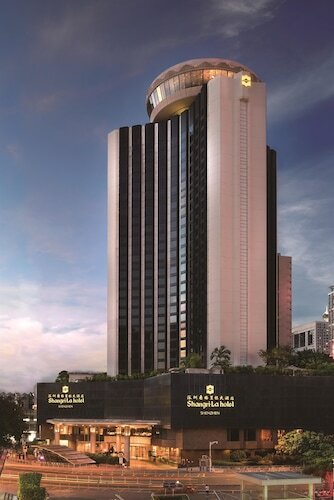 Yantian is where you'll find the Sheraton Dameisha Resort, Shenzhen and Kingkey Palace Hotel Shenzhen. 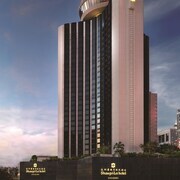 Or, try Guanlan, where you'll find the Mission Hills Resort Shenzhen and Grand Skylight International Hotel Guanlan. Songgang is 35 kilometres (23 miles) from Shenzhen's downtown, while Henggang is 14 kilometres (9 miles) from the heart of Shenzhen. The Fengtai City Hotel and Vienna Hotel are situated in Songgang, while Vienna Hotel and Tongxin Hotel - Shenzhen are in Henggang. Of course, a visit to Shenzhen wouldn't feel complete if you don't make a visit to the OCT East. The The Interlaken OCT Hotel Shenzhen and Otique Aqua Hotel Shenzhen, are all within walking distance of OCT East. The Crowne Plaza Hotel & Suites Landmark Shenzhen and the The Pavilion Hotel are both located a short distance from the Shenzhen Museum. The Crowne Plaza Hotel & Suites Landmark Shenzhen is 2 kilometres (1 mile) away and the The Pavilion Hotel is 2 kilometres (1 mile) away. At Expedia, we know that all travelers have differing budgets. If you're seeking a place to stay at the budget end of the range, Shenzhen boasts some great options. The Friends International Hotel is 25 kilometres (15 miles) from the center of Shenzhen, while the Sentosa Hotel Shenzhen Feicui Branch is 20 kilometres (13 miles) away. 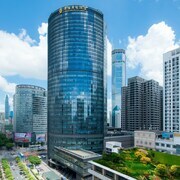 Other affordable hotels include the Venus Royal Hotel (Formerly Kirin Parkview Hotel) and the Novotel Shenzhen Watergate. 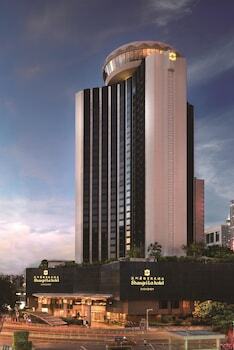 The The Peninsula Hong Kong is located 30 kilometres (18 miles) from the middle of Shenzhen. Or, alternatively, the Four Seasons Hotel Hong Kong can be found 30 kilometres (18 miles) away. Alternatively you could make a reservation at the The Ritz Carlton Hong Kong or the The Upper House. Like to travel a bit further afield? Pearl River Delta offers a number of options. Pearl River Delta boasts coastal plains and rivers, and commonly visited Pearl River Delta sights include temples, shrines and history museums. Popular things to do in this particular part of China include bungee jumping. Looking for things to do? Why not spend a few hours discovering Jindouwan Resort Villas and Jindouwan Shuixiang Vacation Satisfying Paradise, in Tanzhou, 75 kilometres (46 miles) to the southwest of Shenzhen. Expedia-listed Tanzhou hotels and accommodations include the Biwan Hotel Zhuhai and Xindi Hotel. Or, you could consider staying in Zhongshan, 75 kilometres (46 miles) to the west of Shenzhen, where you can pick from the Sheraton Zhongshan Hotel and Hilton Zhongshan Downtown. While in Zhongshan, set aside a little time to check out the Yixianhu Park and Zimaling Park. Hong Kong International Airport is a nearby airport, and is located 30 kilometres (19 miles) from Shenzhen. 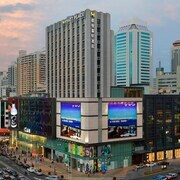 Hotels that are nearby include Hong Kong SkyCity Marriott Hotel and Novotel Citygate Hong Kong. What are the most popular Shenzhen hotels? Are there hotels in other cities near Shenzhen? What other types of accommodations are available in Shenzhen? Explore Shenzhen with Expedia.ca’s Travel Guides to find the best flights, cars, holiday packages and more!